Can it trump World of Warcraft? Dah dah da da da daah dah! 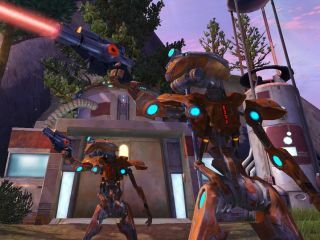 Star Wars: The Old Republic is a new MMO being developed by RPG darlings BioWare and published by the behemoth that is Electronic Arts. You may remember that EA bought BioWare for a cool $860 million back in 2007. This is why. But will it finally knock World of Warcraft off its MMO throne? This and many more questions are buzzing around the TechRadar office today. All will be answered in time, but the buzz around this game is already palpable (as David Coleman might have said!). "In Star Wars: The Old Republic, players will explore an age thousands of years before the rise of Darth Vader when war between the Old Republic and the Sith Empire divides the galaxy," reads the press release. "Players can choose to play as Jedi, Sith, or a variety of other classic Star Wars roles, defining their personal story and determining their path down the light or dark side of the Force. Along the way, players will befriend courageous companions who will fight at their side or possibly betray them, based on the players' actions. Players can also choose to team up with friends to battle enemies and overcome incredible challenges using dynamic Star Wars combat." The team at BioWare employs 12 full-time scribes concentrating on the storyline behind The Old Republic. Which also gets us that little bit extra excited. BioWare co-founder Dr. Ray Muzyka says of the massive project: "In Star Wars: The Old Republic, we're fusing BioWare's heritage of critically-acclaimed storytelling with the amazing pedigree of Lucasfilm and LucasArts, and adding a brand-new fourth pillar to the equation – story. "At the same time, we will still deliver all the fun features and activities that fans have come to expect in a triple-A massively multiplayer online game. To top it all off, Star Wars: The Old Republic is set in a very exciting, dynamic period in the Star Wars universe."